Prestige Roof Deck Waterproofing Orange County Ca does roof deck inspections and consultations free of charge. When it comes to roof deck waterproofing in Orange County Ca we see a lot of improper installation. Many homeowners feel that they can just hire a handyman to fix their roof coating problem. But don’t! Make sure you hire a licensed deck coating and waterproofing contractor to fix your roof deck. Too many times we see roof deck coating failure due to handyman overconfidence. 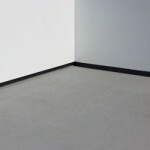 We hire only the best deck coating installers and waterproofing technicians. Each foreman has a minimum 10 and up to 30 years experience. Roof Deck Waterproofing in Orange County Ca is generally over living space, which means if water penetrates it will end up in your house. That is why we don’t take our jobs lightly. Secure the Perimeter! Like in sports or warfare, when you secure the perimeter, nothing can get out, it is trapped. The same is true for waterproofing your roof deck coating in Orange County Ca. At Prestige Deck Coating, we eliminate any possibility for water to escape and give you that unwanted and untimely shower. We take waterproofing seriously. After we secure the perimeter of your deck with proper flashing installation, water on your deck has only one place to go: in the drain. To execute this vital waterproofing goal, we use only custom fitted and situational specific metal flashing. Both on the deck surface and high up the walls, the 90-degree flashing is cut and fabricated to adhere to your deck in a seamless fashion. It is fastened tight to the floorboards and walls studs with industry grade power staples and galvanized deck nails. We at Prestige deck Coating, secure your perimeter. 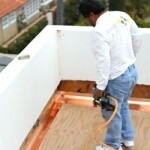 This is the first level of roof deck waterproofing in Orange County Ca. We use only the highest grade products and hold our work to the highest standard. To Prestige, the customer is king. Nothing makes us happier that a satisfied customer. Prestige Deck Coating is located in San Juan Capistrano, Ca. servicing the entire Orange County Ca area, installing roof deck coating and deck waterproofing. Check out our latest roof deck coating in Orange County Ca (right). This deck was on Lido Island in Newport Beach Ca. Prestige Deck Coating also works on Balboa island.